Chief Franks recently attended the District of Muskoka committee meeting and is pleased to announce that Wahta Mohawks has been approved as a Community Safety Zone. This means speed fines will be doubled for a 6.5 km stretch beginning on our west border to just past What A Convenience store and gas station. The signage will be posted soon. There are also two new speed radar signs located at each end of the reserve borders (pictured here). Regular reporting on traffic counts and speed rates from these signs will be available. 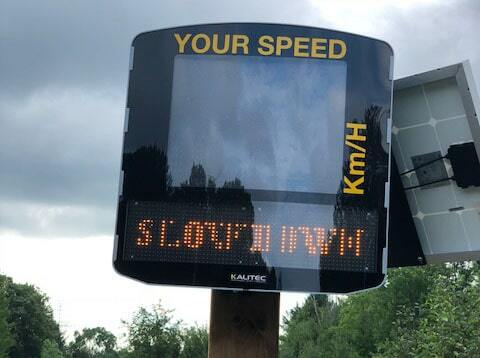 The radar speed signs and the Community Safety Zone initiatives are moving our community in the right direction for increased road safety and awareness! *Please note the picture did not catch the LED portion on the sign very well but it is quite visible to the driver.